Casepad range. Photo: © TETRATAB. 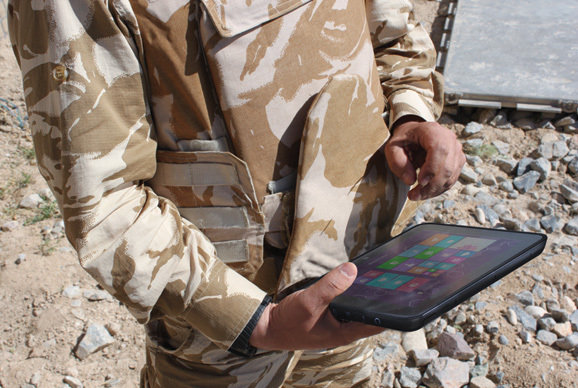 Technology, and in particular Information Technology, has always been essential in the success of any military campaign. This is often why military markets pioneer a number of innovative technologies that then later develop into consumer uses. When it comes to computing technology however, the vast commercial success of the smartphone has shown that commercial markets can make technology possible and change our expectation of how we use technology in our daily lives. Therefore, our expectations in our professional lives have changed too. In your daily life, the smartphone has become what the industry calls your “personal processor”. The processor that you have with you all the time. As the thoughts develop about how that processor can be used, then so do the applications around it. Surveys of how users actually use their mobile phone puts making phone calls around number 6 in the top 10 activities. The majority of uses now are either receiving or sending information through different communication means; from simple texting to social media. So what is the personal processor for the military user? Can it be that the civilian on the street can be better connected than the military user stood by him? In response to this, TETRATAB are announcing the Casepad 5. This is a personal processor device that can be set for military needs in a small and rugged form factor. The Casepad 5 looks like a smartphone but is in fact a powerful tablet device that can run Android or full Windows 8.1 Pro (not Windows 8 mobile but the full pc version). TETRATAB products are all built in conjunction with Intel. They use the power efficient Baytrail T processor; designed to be fanless and maximise battery life whilst giving full pc level performance. The advantage of this device is that it can be implemented under current security structures and run current applications that may be deployed otherwise on larger pc and in-vehicle data terminals. This allows the organisation to review their deployment of existing technology applications in a whole new way. For example, reconnaissance information capture based around a mobile data terminal in an armoured vehicle can now be applied to the individual troop member. Faces of wanted people, identity controls and essential mapping can be securely sent to the individual. All products in the Casepad range are based on the same motherboard technology. This means that a security implementation is identical for the 5 inch, 8 inch and 10 inch device. The charging strategies and the secure telecommunication strategies are also the same. The Casepad 5 can therefore be deployed as an in-vehicle data terminal and be the essential information tool for your vehicle whilst it is in action and then easily removed should the vehicle be out of commission or immobilized by a roadside. Special consideration is given to what happens if the soldier himself is incapacitated. Parallels can be drawn again from the consumer market where the current trend is for body worn fitness devices. With the Casepad 5 as your personal device, it is possible to envisage life signs monitoring and location management. Should the device fall into the wrong hands the security models are already in place to stun and kill the device remotely. The size also allows many more covert operations to be envisaged which we can discuss with clients privately. The Casepad 5’s size means that it can be easily fitted with current clothing. It is lightweight versus its processing power which means there is minimal additional body weight for the troop to carry, which has many knock on effects.